Industrial and commercial HVAC equipment, parts, controls, thermostats, air filters, installation supplies and accessories, computer software and programs, and thermostats. 2019 commercial HVAC online index and directory. Most commercial HVAC systems run on 3 phase electricity. Large commercial HVAC units use semi-hermetic compressors. heat of compression:Term used to depict the amount of heat produced when the condenser's compressor compresses refrigerant vapor. During this process, the compressor produces extra heat that is added to the heat being absorbed in the evaporator. Use the superheat method to determine the total amount of heat needed to be removed from the refrigeration system for efficiency. bag filters:Fiberglass and/or synthetic media air filters that can trap more particulates because of the deep "bag-like" design. Used mostly in commercial and industrial applications where high-efficient filtration is required to meet air quality standards. differential:In HVAC terms, this describes the difference between two settings usually set points or switches. As an example, if you set a water temperature control to come on at 180°F (82.2°C) and go off at 200°F (93.3°C) the differential would be 20°F (11.1°C). enthalpy control:Controls which compare the enthalpy of the return air with the enthalpy of the outside air, and then position the economizer's damper to allow a percentage of air with the lowest enthalpy. hermetic & semi-hermetic compressors:Known as a "can", hermetic compressors contain the motor, piston and shaft assembly, and oil heater in the same sealed unit. Factory welded closed, a hermetic compressor cannot be opened and serviced. Most hermetic compressors are under 24 horsepower and can become overheated when drawing excessive current (amperes), operation is abnormal (i.e. short-cycling), or refrigerant levels are low. Hermetic compressors contain an internal thermal overload device that will open when overheated. Semi-hermetic compressors are usually found in commercial HVAC applications. These "engine" type compressors have accessible parts and can be serviced internally. There are several types of sensors mounted on and in the compressor for safety and damage protection. Semi-hermetic compressors are more arduous to service and maintain compared to a hermetic. liquid receiver:Used on refrigeration systems and installed on the discharge line, it is the storage tank between the TXV and the condenser that keeps excess liquid refrigerant from entering the system. Service valves installed on the receiver allows the technician to read the system's pressure. Most receivers are equipped with a relief device if pressures become too high. This limits most discharges of excess pressure at the receiver. Not to be confused with an accumulator that is attached on the suction line at the condenser's compressor. An accumulator's function is to trap any liquid refrigerant that passed through the evaporator and before it reaches the compressor. It also assists in bringing back any oil that would migrate from the compressor with the refrigerant. Though they can become plugged, an accumulator is one of the last things to fail on a properly maintained system. relative humidity:A ratio measurement in percentages of the water vapor in the air compared to a complete saturation (100%) of the same air. Tech Note: A misconception about humidity is the capability of air to "hold" water vapor. Water molecules are lighter and faster moving than nitrogen and oxygen molecules. A basic formula for relative humidity is: Actual Vapor Density divided by Saturation Vapor Density times 100 percent (RH = AVD / SVD x 100%). refrigerant coil cleaners:Chemical cleaners formulated to clean condenser and evaporator coils. Coil cleaners come in several types for different applications. These types are acid, non-acid, foaming, non-foaming, concentrated, and spray-on. The harshest of these chemicals are the condenser cleaners. Condenser cleaners are usually acid based and should be used with caution! Do not used an acid base cleaner on an evaporator coil. A very dirty evaporator coil may need to be removed from the plenum or air handler. Sometimes this may not be done without kinking or breaking the refrigerant lines. The refrigerant will have to be reclaimed and the pipes cut and capped off so no moisture gets into the system. Keeping air filters clean or changed will keep an evaporator coil clean. enthalpy:In HVAC terms, enthalpy (total heat) can be defined as the measurement of sensible (dry bulb temperature), and latent heat (wet bulb temperature) compared with relative humidity, at a constant ambient pressure (14.7psi). Compare these figures with a psychrometric chart to acquire enthalpy in BTUs per pound (BTU/lb) of air. Tech Note: A formula for calculating enthalpy (BTU/lb) using the dry bulb temperature in Fahrenheit (db) and relative humidity (rh) = (0.24 x db) + (0.62198 x (rh / 100) x (-10440 / (db + 459.68) -11.29465 - 0.02702235 x (db + 459.68) + 0.000012890 x (db + 459.68)2 - 0.00000000247807 x (db + 459.68)3 + 6.55 x (db + 459.68))) / (14.7 - (rh / 100) x (-10440 / (db + 459.68) -11.29465 - 0.02702235 x (db + 459.68) + 0.000012890 x (db + 459.68)2 -0.00000000247807 x (db + 459.68)3 + 6.55 x (db + 459.68)))))) x (1061 + 0.444 x db)). commercial thermostat:A temperature control for commercial or industrial applications. These thermostats are installed for the type of system or space it is controlling. Some examples of commercial thermostats are zone, line voltage, proportional, programmable, and wireless. While thermostats are controlled by temperature, they are not always used for air conditioning or heating systems. Thermostats can be used for ventilation systems and controlling temperatures for different commercial and industrial mechanical applications. compressor capacity control:To meet changing load conditions, a semi-hermetic compressor should have some form of capacity control. When a HVAC system is forced to perform in conditions above normal operation loads, capacity control provides the compressor a form of "relief". This can aid in compressor short cycling, energy efficiency and premature mechanical failure. HVAC manufacturers have engineered different methods to manage capacity control in their units. Some methods include staging multiple compressors, cylinder unloading, hot-gas bypass, variable speed or moduload compressors. The multiple compressor method allows redundancy over single compressor systems. Each compressor comes on or off to operate at certain load conditions. Cylinder unloading is a process achieved by blocking or redirecting refrigerant vapor from entering the compressor's unloaded cylinder. Hot-gas bypass is a method to keep the compressor's suction pressure from dropping below a fixed setting by redirecting a portion of the compressed vapor. Variable speed compressors raise and lower refrigerant pressures depending on load conditions. Moduload or discus compressors are specifically designed by Copeland® to permit compressed vapor to enter an area above each cylinder and draw back into the cylinder during its down stroke. These forms of capacity control allows the compressor to perform at its engineered limits. Preventing liquid refrigerant from entering a cylinder and managing refrigerant pressures during unpredictable load conditions are crucial in any compressor's operation. electric phases:There are three different phases of alternating current (AC) electrical power: single, two and three-phase. The number of the phase corresponds to the number of conductor wires (also called a leg, lead, or hot wire). Each phase type has one neutral or common ground wire. Single-phase wiring has one conductor wire and one neutral. Three-phase wiring has three conductor wires and one ground wire. To understand electric phases, you must understand the principles of electricity and how it is generated and distributed. Most electric-generating power plants produce three-phase alternating current power. Each phase, though independent from the other, is distributed at a 120° offset. To explain the offset, we start with the diameter of a circle which is 360°. If you have a round clock with only one spinning hand and at the number twelve, the number four, and the number eight, the hand triggers electric current to flow through an independent wire; you could say that at every 120° the hand spins, a phase of electricity is produced. At a power plant, an electric-producing generator also completes a full revolution at 360°, and produces a phase of electric current every 120° in the revolution. The voltage in each wire will vary but stays relatively the same (1%-4% differential) by the time it reaches its load. A typical residential house is supplied with single-phase electric power. A typical commercial/industrial building is supplied with three-phase electric power. Power plants generating two-phase AC power still exist but are very few. Single and three-phase is the most common electric power in the world, but voltages vary from different regions and countries. energy management system (EMS):Term for a computerized system that controls and monitors the performance of applications, components or devices that use energy to operate or perform a specific duty. In HVAC (unitary) applications, an EMS modifies and measures temperature, humidity, energy consumption and performance based on outdoor and indoor set points. An EMS can also meter and record data and transfer this information to specialized computer programs allowing the user to make better decisions on optimizing the system's settings. Commercial HVAC systems are much different than residential systems. 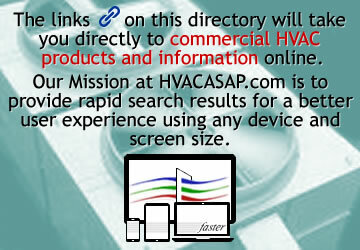 This directory contains an index that will guide you to a specific commercial HVAC topic or item. This web page focuses on commercial and industrial heating, ventilation, air conditioning and energy management systems. This directory, and its referenced sites, was developed for the technician, business owner, and engineer to assist in researching or finding a commercial HVAC-related topic. When browsing this commercial HVAC directory, let us know if there is a related subject you would like to see added.